Give the gift of experience that’s sure to delight and awaken the imagination of everyone young and old! 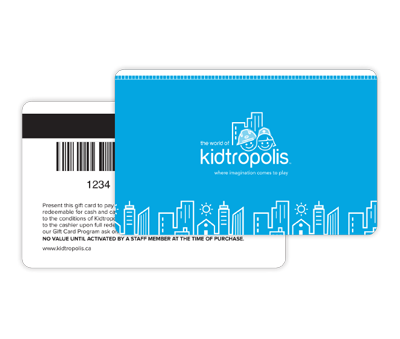 Pre-loaded gift cards in a number of denominations are available for online purchase and can be used towards general admission, at our Munchies cafe or towards any Kidtropolis events - it’s just like cash! Come and create lasting memories that they will cherish forever! Gift Cards purchased online will be mailed via Canada Post (unregistered mail) to the provided mailing address on your order. A $2 shipping and handling fee per card will be added to your order. For more information or to purchase a different amount, visit our Front Reception or give us a call! …imagine the world they can create! Where imagination comes to play!